Wire rope or as they are often referred to - cable railings have been used indoors and outdoors in industrial and commercial buildings for a number of years. But recently wire rope is gaining popularity in both indoor and outdoor residential construction, remodeling, deck, and balcony construction, as shown in Figure 15. 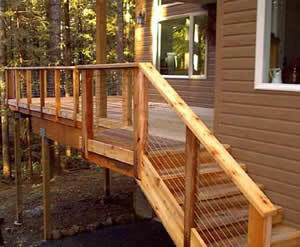 Wire rope railings and the new fittings that are available are aesthetically pleasing. 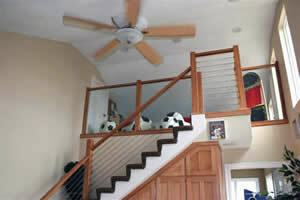 One of the biggest advantages to wire rope railings is that unlike conventional baluster style railings, wire rope railings provide an unobstructed view. 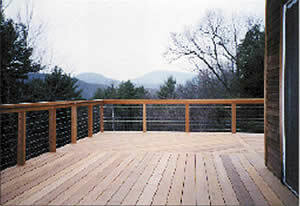 Note: Before installing a wire rope railing, check with your local building department to determine if it will meet building code and if so, if there are any specific requirements, such as the diameter or the number of strands of the stainless steel and/or the vertical distance between rows of wire rope. 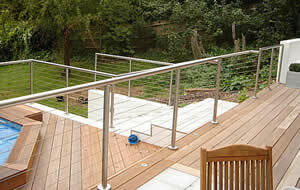 As with most products there are different quality levels of stainless steel wire rope railing materials. The stainless steel wire comes in many sizes and strands. The more strands in a given size the better the strength of the wire. As well, more strands will provide a smoother appearance and smoother feel to the touch. Stainless steel comes in numerous grades. 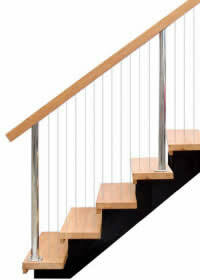 The two most common for stainless steel wire rope railings are 304 and 316. 304 stainless steel over time, will develop brown spots known in the trade as “Tea Stains”. 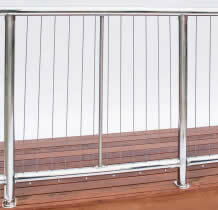 To avoid having brown spots appear on your stainless steel wire rope railing and fittings purhase 316 stainless steel wire rope and fittings. 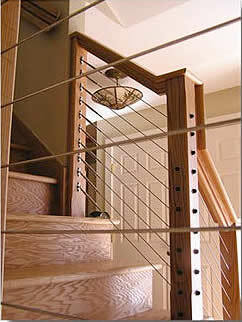 New style fittings make the installation of stainless steel wire rope railings an easy DIY project. 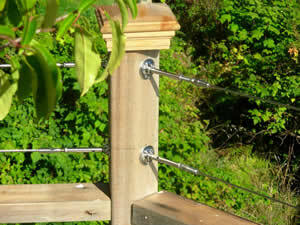 The new style fittings provide easy connection to wood or metal posts and provide a convenient method for tensioning the stainless steel wire rope. 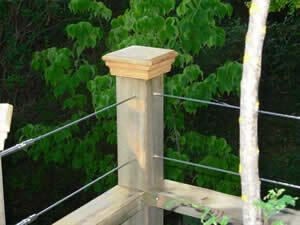 The posts that connect the stainless steel wire rope railings can be made of wood, stainless steel or concrete. 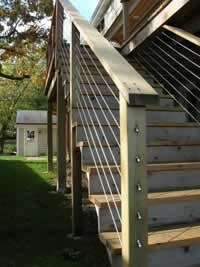 Following are some pictures of stainless steel wire rope railings. 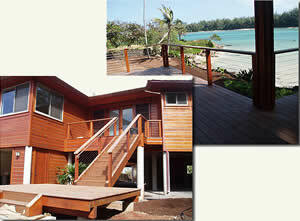 As you can see the stainless steel wire rope railings can be used as regular balcony, deck or stairway railings. 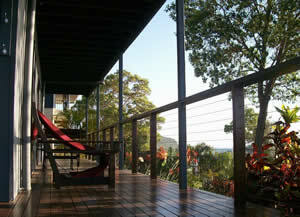 In most cases stainless steel wire rope is installed horizontal to the deck, balcony or stairway. However, in some instances it is installed in vertically, as shown in the following pictures.